It's no secret of my alliance and affinity to Michigan made beers. With the way the state's economy is I figure that the more money spent in Michigan on Michigan made products the more people it keeps working here. There aren't many job prospects out there right now so any way of keeping the people of this fine state working the better. This does not mean that Michigan breweries are exclusively 100% on my radar. One of my favorite ever NON-Michigan breweries is Downington Pa's Victory Brewing Company. While taking a beer hunting trip a county over finding some of this, a recent addition the brewery stable, was on the top of my trophy list. At the time I wasn't even too sure it was being sold in Michigan (and even if it was figured that our local distributor blew off getting it in stock because it would leave less room on their warehouse shelves for something stupid like Bud Lime Wheat Light Ice or some other macro aberration). I was very happy when I spotted this at Champane's in Warren. Dark mahogany in color and a 3/4 inch tan colored head that holds on for quite awhile leaving a thick lacing behind all the way to the bottom of the glass. Scents are quite robust with a Rye ale characteristic big on the tip along with aroma's of brown sugar malts and a pine forest after a summer rain. Sweetness & earthiness rolled into one. The brew's flavor has quite a levels of complexities to it. A molasses & perhaps cardamon flavor steps up first with some toasted bread right behind it. Very piney hops quickly follow it pushing the OOMPH factor up a bit more. It's almost along the lines of an IPA but there's a dark fruit thing instead of grapefruit and pine that those usually carry. I can't quite put my finger on what I am tasting but it is tasting very interesting and quite good. The finish then throws in another curveball in the taste with a ginger hotness chocolate notes and rye. The mouthfeel is full yet bubbly and has quite a chewiness to it. Ron Barchet, co-brewmaster at Victory, has said “I thought of hop farmers as I formulated this beer. I wanted to create a malty platform to showcase the intense flavors and aromas that these dedicated hop-farmers have developed in their wonderful hops” concerning this latest brew from their always impeccable company. Using hops from one of the most noted area's for such things this tribute to them shows much respect and honor. what a poetic description of beer. you writing hippie songs now? Holy cow - I must be way out of the Victory loop since I didn't know this beer even existed! I love big malts in a brew - gotta give this one a try. Perhaps I can persuade my wife to take me to Victory for my birthday meal in March. I'm jonesing for a Baltic Porter too. This never made it up this far did it? I never saw this around Port Huron. Do you know why Victory beers are easy to find in other parts of the state but not here? I gave up being garage rock years ago. It's quite an interesting brew. 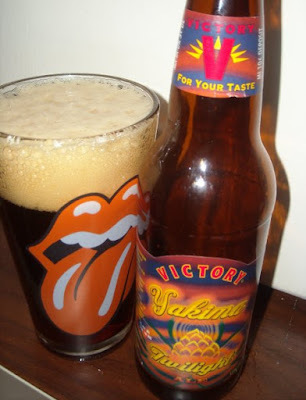 Even with it's name change to 'Yakima Glory'-it's still quite stellar. I seems there has been a lot of gaps in Victory's distro to St. Clair Co. I don't know if it's because who distributes it locally is not on the ball (see the constant complaining of how Founders, which is a Michigan brewer, specialty brews never hit the area...and the passing the blame the local distro does) or if their are other factors.